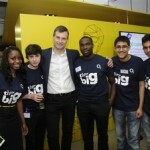 CEO Ronan Dunne with some young Think Big supporters. Our people engagement journey really began with a few disparate, keen volunteers doing lovely community projects around the country, happily making a difference to things they cared about, and bringing along their teams for team building. And so in early 2010, our business launched Think Big. The sustainability mission became focused, joined up and the journey to embedding sustainability into the way we do business began. The first challenge was to explain our plans to our people. ‘Sustainability’ means something different to everyone, it is complex and confusing – at best. To remove this ambiguity, Think Big is a term that covers all our activities that involve social and environmental change for good. Initially we launched Think Big with a big vision, and just six big goals (sustainable products and services, waste, water, travel, energy, and our people helping young people) clearly laid out, with a very strong brand presence and lots of nice sparkly bits. Think Big joins up our environmental and our social agenda, bringing the opportunity to engage people who might be less interested in one side of the programme with the subjects on the other. Likewise this joined up approach means the cost associated with supporting young people and campaigning can be offset by the benefits associated with environmental sustainability. Having laid out the plan, excited and informed, the calls to action led to a flurry of interest and the recruitment of sustainability change agents on each of our main sites. Welcome the ‘Big Thinkers’. Recruiting is one thing though; supporting, managing and steering passionate people is another. O2 employees in Glasgow break the world record for recycling the most mobile phones in a week. The Big Thinker teams have taught me that passionate people can literally move mountains. Engaging Big Thinkers takes time – lots of talking, lots of emails, calls and face-to-face meetings – explaining why, what and how again and again. But we now have around 100 Big Thinkers across our business, all with time from the business to bring Think Big alive. Last year alone they helped support over 11,000 young people to gain work skills through their infectious passion and brilliant organisational skills. Our heads of each Big Thinker team, six in total, are all experienced people managers in their own right. They are known and respected across our business – vital for engaging and supporting others, but also for getting things done (sometimes in the face of significant constraints and barriers). Big Thinkers now recruit one another, through peer support, with regular comms and recognition ensuring a community of shared stories and best practice. We also allow for engagement across borders – ensuring that remote engineers are as able to get involved as those in our larger sites. We have an email specifically for those interested, which each week is stuffed with notes, pictures and articles from teams around the business, all delivering great actions in the name of Think Big. What we see from people getting involved in Think Big is that they score higher on our business’s employee engagement survey, ‘Reflect’, across all the survey, from more engaged with their teams, to more likely to seek their next role within our business. 70% actively state that ‘Think Big makes them feel better about our business’. We have also worked with external social impact specialists from Durham University who show that those involved feel part of something special and feel better connected to our business– regardless of whether they are home workers or store based. We can also see that those people who are developing and delivering their own activities get more personal development from the programme – including networking, confidence and communication skills. But we wouldn’t have known this if we hadn’t been measuring everything throughout. However, embedding Think Big into the way we do business is more than grassroots people engagement – it’s about embedding it into the employee journey. We have been working to ensure there are Think Big touch points at every step, from recruitment to the on-boarding day, from mandatory training courses to recognition and reward programmes. Last year Think Big became one of our four brand pillars and became an objective for each person within our business. Having a sustainability objective seems simple – there are so many to choose from – but with three quarters of our business highly matrixed, every objective boiled down to one KPI. Distilling Think Big into one numerical objective seemed counterproductive, so we have been working with our Big Thinker teams and with HR to develop a pledging tool, allowing people to choose actions, each with associated points and a coaching pack to help managers have quality conversations around the subject. We aren’t there yet, but we are working on it. And finally, this blog post wouldn’t be complete if I didn’t mention our CEO, Ronan Dunne, and his board – they all vocally support Think Big and push each other to Think Bigger. We have worked hard to ensure each board member gets personally involved. We work to keep them informed and enabled to support their teams and ensure they truly understand how Think Big supports our business, customers and people. This year our board, as well as driving our business hard to deliver our Think Big Blueprint Commitments, have also chosen to each go public on their Think Big objectives, driving and leading their teams through the process. Helping young people gain skills for life is one of the key objectives of Think Big. Our vision is to embed Think Big into the way we do business, to help our customers live more sustainably through our products and services, to help young people gain skills for life, and to reduce the UK’s environmental footprint. Research time and again shows that the biggest impacts come from people power and that the biggest human motivator isn’t cost saving or saving the planet, or even ensuring job, personal or financial security. It is peer pressure – we like doing things because our friends are, because our leaders are and because we want to be part of something. ( see Alex Laskey and Suzanne Shelton. ) We work to the same principles, showcase what everyone else is doing, enable others to get involved too, through simple activators, and then share stories. Repeat – again and again and again. Start small, Think Big is our motto. Engaging our people is vital for success, wherever they may be based, whatever they may be doing.